Nine BUA students are volunteering with Communities in Schools to serve as pen pals with 4th graders from nearby Kindred Elementary. Servant leadership is a fundamental ethic cultivated at BUA. This school year nine BUA students are volunteering their time to participate in the Communities In Schools Pen Pal Program. Each BUA student is serving as a pen pal for two fourth graders from Kindred Elementary, which is a couple of blocks from campus. 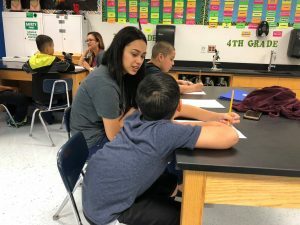 The program pairs elementary students with community members to help elementary students practice and develop their writing skills, as well as provide a positive role model and mentor, explained Sophia Botello, instructor of English and director of the Writing Center. BUA has been involved with CIS for ten years, serving in a mentoring program at South San High School, but this is the University’s first year participating in the Pen Pal Program. The University also connected CIS with local ministers. Writing and receiving a hand-written letter every two weeks offers several benefits. It helps the elementary student learn and practice proper letter writing format, grammar and vocabulary. Connecting with a college student also encourages them to continue pursuing an education. “I can’t explain how it touches my heart that these students at BUA volunteer their time to connect with students in the community. It is heart touching and indicative of the type of students we have at BUA,” said Botello. Three of the BUA student volunteers are international students. Many of the elementary students have not had the opportunity to explore beyond their home communities. Connecting with an international student opens their minds to the world. “This program highlights the hearts of the BUA students, and I am so happy to be a part of it,” said Botello.